Question One: What do you call a naked transvestite? Answer: Eddie Izzard. Question Two: But what do you call a naked Eddie Izzard? Answer: That would be telling now, wouldn't it? Probably something obscure like aubergine or aardvark. Or alternatively you can can be a bit more creative and say something like aubergine-aardvark with a slice of melon on top. Or better yet, I'm sure that you would much rather prefer to watch Eddie in this 90 minute stand-up comedy show made in 2008. This is it! 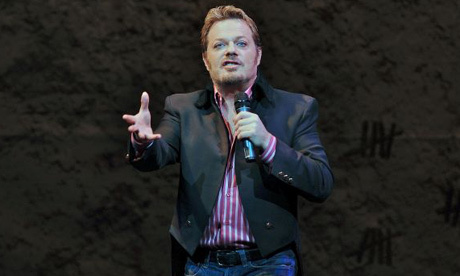 Eddie Izzards stand-up comedy performance live from the Lyric Theater in London - on DVD. Now Eddie, in his own interminable way, witters his way through numerous topic of note, garbed in a butler’s jacket and plastered in mascara. Moreover, his stream of consciousness delivery is one half Python and one half rambling lunatic – as he is able to saunter from topic ‘a’ to topic ‘b’ via an un-calculatable topic ‘z’. Oh! Wait a minute! I best tell you about what he says first, right? Well, Eddie starts off his show commenting on Wikipedia, before satirizing such topics as the bible – evolution – civilization – war – the dinosaurs – the Stone Age – ancient democracy – Darwinism – animals – Noah’s arc – and God. But not only does he do that dear reader, oh no, he also reiterates on a diary driven Squid – a cow that goes ‘moo’ – a reptile in a hat – a trumpet playing duck – and a hippy squirrel. Once Eddie has finished his last gag, he takes his final bow, and then slides back into Eddie-Land where all of the special people go. Now this one man stand-up show by the honorable Mister Eddie Izzard himself, is a verbal ennui of paradoxical thought, expressed through the rambling’s on my favorite cross-dressing comedian (i.e. it's funny). Moreover, this time Eddie doesn't look like a reject from the Rocky Horror show (click here for the review), instead, he looks like a perfectly groomed camp Elizabethan grungy butler (don't click here for the review). OK, so is his appearance a positive thing or a negative thing in retrospect? Well, both really. On a positive note - it doesn't distract from what he’s saying. Whilst, on a negative note - he always looks funnier when he’s draped up in drag, which on occasion can help him out when his improvisation doesn't seem to come across that well. And does this happen in 'Eddie Izzard: Stripped'? A fau'par or three? Yes, once or twice, half way through. Nevertheless, Eddie, being the consummate professional that he is, manages to riff off of any stumbles that may come his way, and makes his way back into ‘Eddie Land’ with a HONK-HONK, a WA-WA, plus a DING-DONG! Personally speaking, Eddie’s performance is rather solid though out this show, and sometimes it’s very hard to figure out if what he is saying has been scripted or made up on the spot – it’s that fluid. Another thing which helps him piece together his eclectic rambling’s, is the way in which he keeps on referencing characters that he’s made up during his spiel. My own favorites out of this bunch are the hippy squirrel and the jazz playing duck, because for some strange reason they seem to adder to my own surreal satirist leanings. But then again, there are plenty more to choose from you know. There’s the Spartan sheep – the cow which goes ‘moo’ – the hat wearing reptile – the Squid which uses a biro – and of course, God, care of Sean Connery. Please note, the version of 'Eddie Izzard - Stripped' which I watched was the 90 minute televised version, which is obviously fractured compared to the 140 minute DVD version. So I think I best watch that one next, huh? Care to join me? No? You bugger! What do you say Ed?